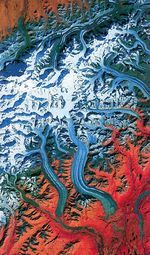 Hi-resolution poster of the Hawaiian Islands lossy compression (8.9 MB JPEG) lossless compression (34.9 MB TIFF) Boasting snow-covered mountain peaks and tropical forest, the Island of Hawaii, the largest of the Hawaiian Islands, is stunning at any altitude. 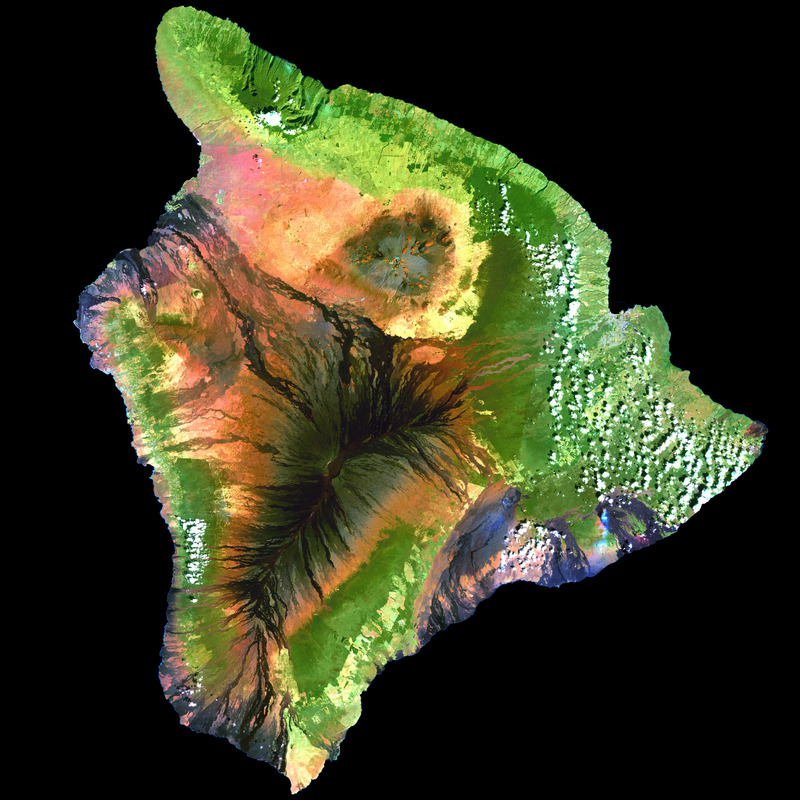 This false-color composite (processed to simulate true color) image of Hawaii was constructed from data gathered between 1999 and 2001 by the Enhanced Thematic Mapper plus (ETM+) instrument, flying aboard the Landsat 7 satellite. 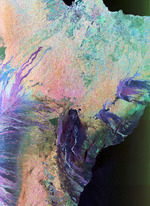 The Landsat data were processed by the National Oceanographic and Atmospheric Administration (NOAA) to develop a landcover map. 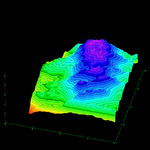 This map will be used as a baseline to chart changes in land use on the islands. Types of change include the construction of resorts along the coastal areas, and the conversion of sugar plantations to other crop types. 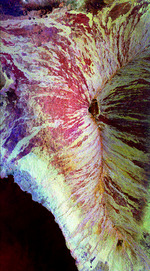 Hawaii was created by a “hotspot” beneath the ocean floor. 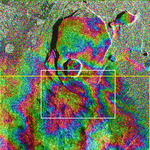 Hotspots form in areas where superheated magma in the Earths mantle breaks through the Earths crust. Over the course of millions of years, the Pacific Tectonic Plate has slowly moved over this hotspot to form the entire Hawaiian Island archipelago. The black areas on the island (in this scene) that resemble a pair of sun-baked palm fronds are hardened lava flows formed by the active Mauna Loa Volcano. Just to the north of Mauna Loa is the dormant grayish Mauna Kea Volcano, which hasnt erupted in an estimated 3,500 years. A thin greyish plume of smoke is visible near the islands southeastern shore, rising from Kilauea—the most active volcano on Earth. Heavy rainfall and fertile volcanic soil have given rise to Hawaiis lush tropical forests, which appear as solid dark green areas in the image. The light green, patchy areas near the coasts are likely sugar cane plantations, pineapple farms, and human settlements.